This guide is outdated. Please check out the updated version of this guide here. First you need to add C:\cygwin\bin to your PATH Environment Variable. You can do this from My Computer > Properties > Advanced > Environment Variables. You might also have to add C:\cygwin\usr\X11R6\bin to PATH. Then you need to create two batch files. The first one is to start X, and the second one is to start aterm (or whatever X app you want to start). 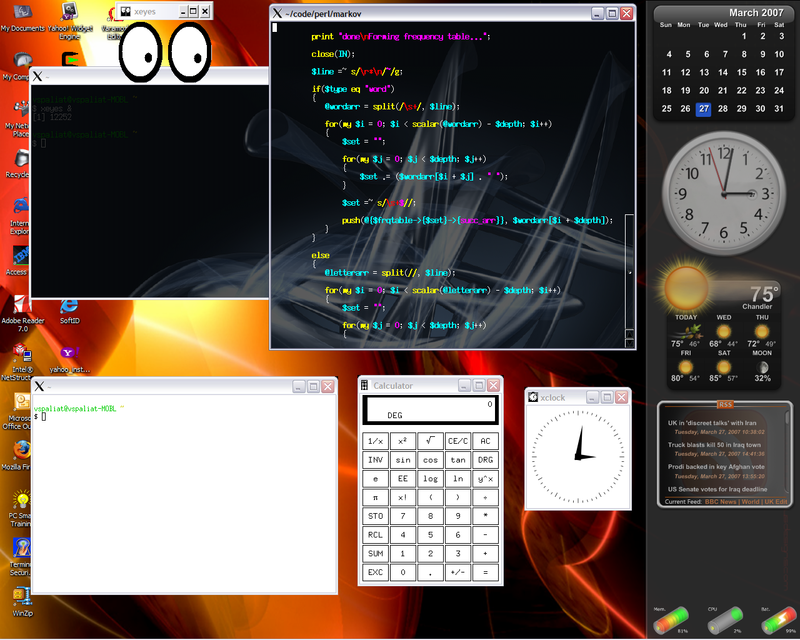 The example I’m going to show includes starting up X with a wallpaper (using xv), and then running aterm. I run aterm with a transparent background, using the X wallpaper. However, you can also load aterm with a background image of your choice. C:\cygwin\usr\X11R6\bin\run.exe C:\cygwin\bin\bash.exe --login -i -c "aterm -sh 50 -tr -trsb -fade 20 -tint gray -bl -sb -st -sr -sl 1000 -tn xterm"
C:\cygwin\usr\X11R6\bin\run.exe C:\cygwin\bin\bash.exe --login -i -c "xv -display :0 -root -quit -be -max /cygdrive/c/Wallpapers/upper_limit_wp_dark_1600.jpg &#38;&#38; aterm -sh 50 -tr -trsb -fade 20 -tint gray -bl -sb -st -sr -sl 1000 -tn xterm"
This batch file will load xv every time you start aterm, so there is a slight performance hit on startup. However, it’s not that big of a deal because the xv instance quits right after it sets up the wallpaper, and so you’re not loading a new instance of xv into the memory every time. Well, there you have it. I hope it was helpful! Haha! I don’t know, but it would be fun to try out! I know I was successfully been able to get KDE running under Cygwin a few years ago, but it was really slow. Compiz-Fusion would probably be really slow as well. I can’t find "xv" on cygwin’s installation page. Do you know what section / package it is under? You can get xv from here. I remember the last time I did this, I had a bit of trouble with xv. So I think I used xsetroot instead. That binary should come with the X windows package on Cygwin. Thanks got it working w/ cygwin. One hiccup I ran into on the way is when building aterm from the source. I got an error regarding an unsupported parameter "-rdynamic". I did some digging and found that the copy of gcc that comes with cygwin expects "–rdynamic" with two dashes. Yeah, I probably should have mentioned that, but it’s been a while since I compiled it from source. It’s one of the gotchas when building from source in cygwin. Glad you got it working!